Genetic Testing: The Frontier of Personalized Vision Care? 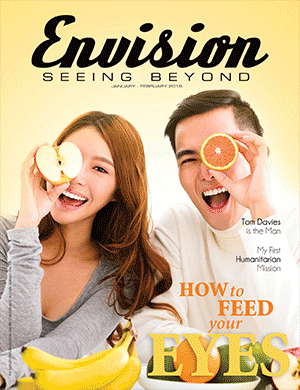 When originall y proposing this issue’s feature story on nutrition and eye health last year, I blithely imagined it as a sunny tale about green spinach, tasty salmon and the occasional vitamin supplement. Little did I know that a major controversy would now be dividing the vision science community, a controversy that credibly suggests that significant harm may have resulted from scientific ineptitude or worse. Portrait of a Designer – Who is ‘Slamming It’ with Bespoke Eyewear? Fun and functional, elegant and sporty, colourful and sublimely sedate, there is so much to choose from in sunwear right now. We’ve come a long, long way from the innovations of earlier days and find history being made with the latest innovations in material and design. 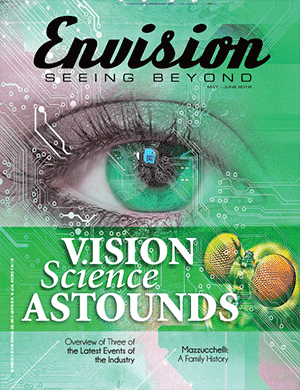 Vision science research continues to astound. Our feature covers three exciting developments that may have profound impacts on patient wellbeing and practice management. A self-focusing contact lens, a solution to dissolve cataracts, and eye drops that resolve presbyopia are included in this feature. The kid’s market is growing at a healthy clip and you can be part of it. Children and youth need eyewear for school, sports and sun protection. 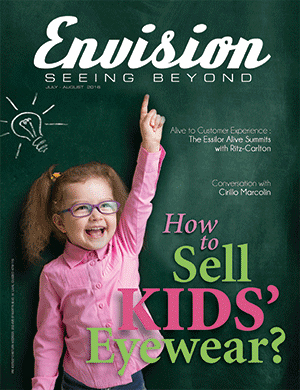 Our feature brings the brightest and best new frames for kids to your attention. With back to school almost upon us, this is the time to stock up! Event – Optifair a Smashing Success! 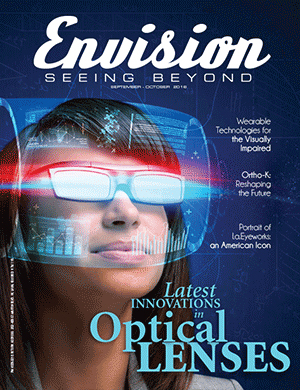 Our annual lens feature highlights a speedy lens delivery system in Toronto and shows how enjoyable shopping for lenses can be with new virtual reality tools in your clinic. 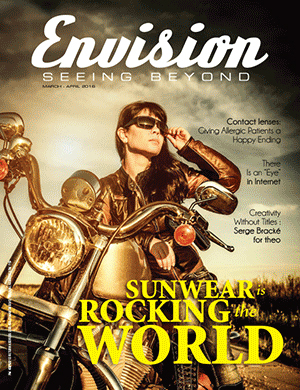 We also cover the latest lens trends from market leaders. Might your clients be looking for golden nosepads? How would you know? 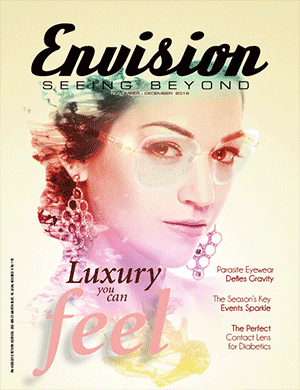 This issue explores several facets of luxury eyewear, including the business case, the art of the upsell and new designs from leading suppliers. Whether you go for fine jewels or artisanal design, it’s all here for you. Event – VEW Always a Time For Celebration! Lens focus – Constant Contacts? Hardly.